The Table Jack is the most advanced table stabilizer on the market today. The Table Jack uses a patent pending mechanism to stabilize table bases with ease while stopping the frustrating wobble that occurs with most restaurant style tables. Using a revolutionary single Table Jack unit, restaurants and customers can easily adjust table wobble back and forth or side to side with a simple press of the foot. Built for use in commercial environments such as busy restaurants and bars, the table jack system is incredibly easy to install and comes in with the hardware to fit most style table bases up to 2 1/4″ width. Already installed in some of the most demanding restaurant locations, the table jack stands up to the most harsh environments while providing its customers a truly wobble free experience. Buy the tablejack now and see for yourself how easy and wobble free a table can be. Pre-­‐opening Labor Costs -­‐ Two staff personnel spend one hour a day adjusting table glides before customers arrive at $7.25 to $8.50 an hour which equals $14.50 to $17 a day or approximately $5,000 a year. Table Jacks, which carry a two-­‐year manufacturer’s replacement warranty, can be installed in the average restaurant with 25 – 30 tables at the manufacturer’s suggested retail price for under $500. The net cost savings, in the first year alone, of using Table Jacks compared to the competitors’ unreliable products is approximately $8,600. 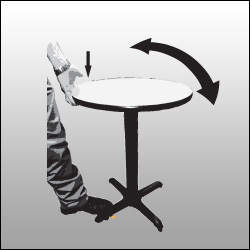 If the table rocks from side to side (or sideways from the tablejack), hold the table top from the under side with hand, press down the tablejack lever, lower table until it stabilizes on the other three glides and release lever. 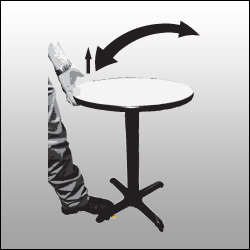 If the table rocks towards the tablejack, slightly lift the table from the tablejack side, step on the tablejack lever, lower the table down until it stabilizes on the other three glides and release lever. If table is still not stable, repeat steps listed above. You can also visit their Homepage for more information.